After firing five rounds of Winchester 180 gr Ranger from a Glock 27 into synthetic ballistic gelatin from 10 feet away through four layers of fabric to simulate clothing, we then measured the expansion and penetration of the bullets for this .40 S&W (Smith & Wesson) load, which you can see in the chart below. 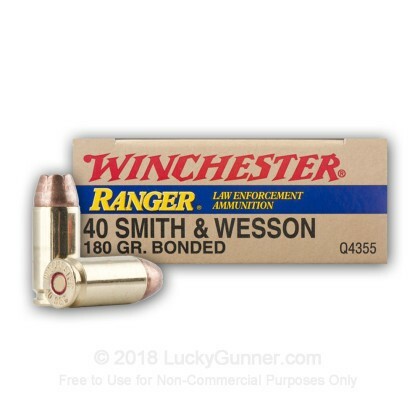 Finally, if you'd like to see how this Winchester load compares to other .40 S&W (Smith & Wesson) loads, check out the diagrams at the bottom of the page. 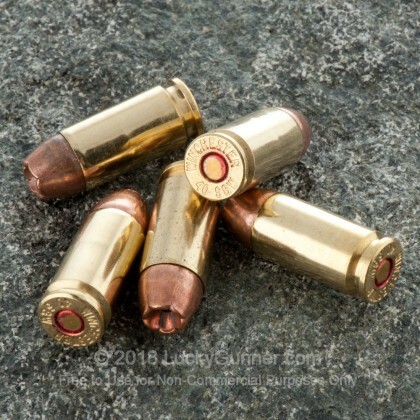 Want to know more about our ballistic gelatin testing and self-defense ammo? Check out Lucky Gunner Labs for more information. 14.4" 0" 9.8" 16.5" 32" This ammo: 14.4" Min: 9.8" Median: 16.5" Max: 32"
I've been using this round for 10 years as duty and off-duty ammo. It's the only one I trust. Fires smooth and never had a malfunction through a SIG229 and Glock23. Best carry round for 40 S&W...a late member of the old Talon family. Used in my concealed carry weapon while hunting. Great value, impressive effect on coyotes. I fear no ferral pig with this ammo. Accurate at 50 yds. Of course I was resting my 3.8" pistol for the 50 yd test. In a word GREAT.I feel very secure using this round for personal protection. Basically I would and am trusting my life to it. Best personal defense out there! Very accurate. 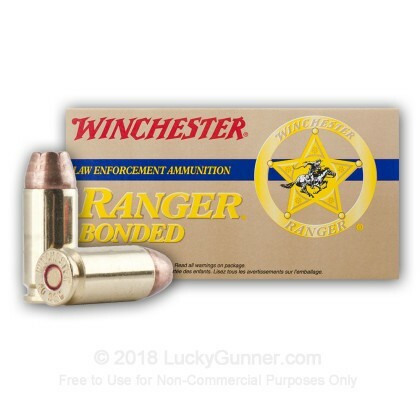 These Ranger bonded are a steal for the price they shoot well are clean and react in the same manner as the PDX1's.I sat the two side by side and the only differences that you might notice 1) The casings (Ranger bonded has a brass casing and PDX1 has a nickel plated brass casing).2)The inner cones are slightly different(the bonding is just a little cleaner in the PDX1). 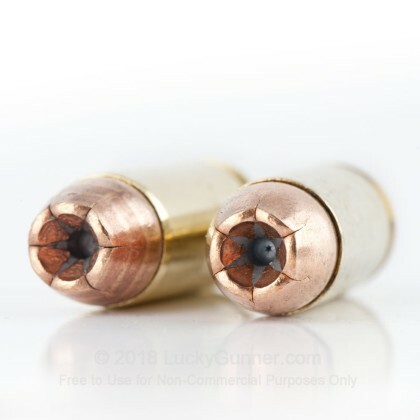 This ammo functions flawlessly through my S&W SD40. It's accuracy is above my skill level. 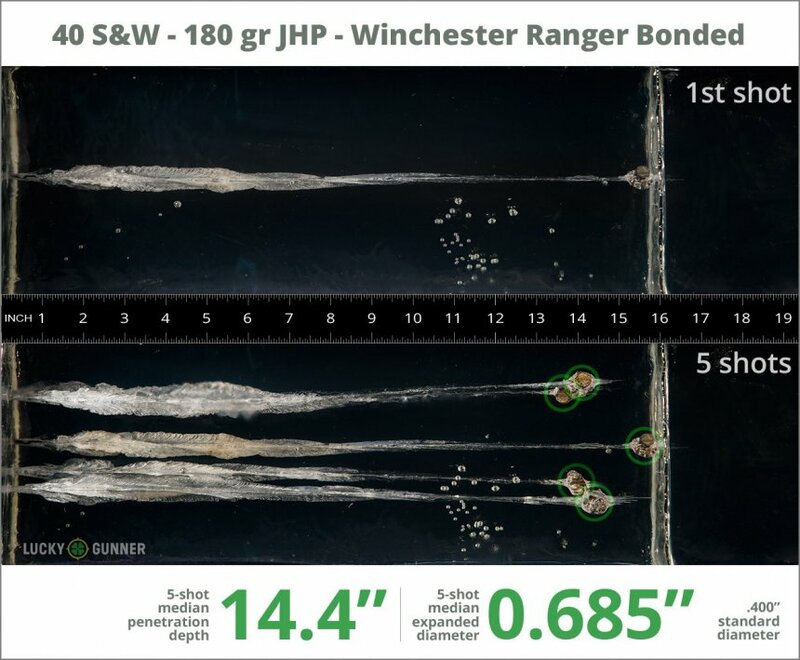 My local police department recently switched to this bonded 180 grain load so I feel it's a great choice. Shipping was lightening fast. I'm very pleased with LuckyGunner. 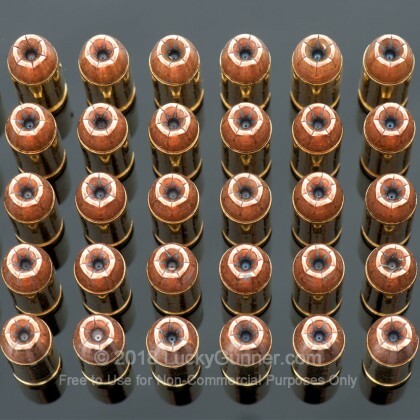 Used in a Glock 22 with a Lone Wolf barrel; this is a very accurate round at 25 yards, while using-up a few boxes; had no feeding, extraction, or ejection problems; I read that the FBI had the PDX1 rounds packaged in the 50 round Winchester Ranger boxes; can't say that these are the same rounds, but after mixing a few of these and PDX1 rounds; I can't tell the difference. I've shot about 300 rounds of this through my Glock 23 without a single issue. 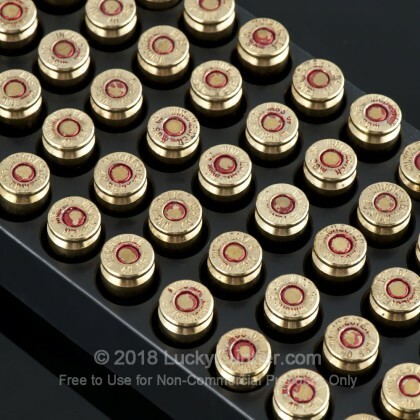 I'm not all that concerned about expansion patterns and penetration and all that, because it's so cheap I am only using it for plinking and target practice at this point. Pretty clean ammo for my Taurus .40 cal. Price was RIGHT Too! 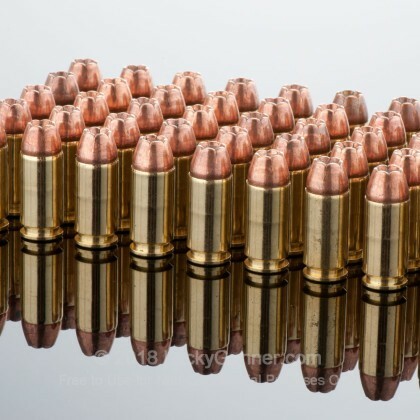 I fired about 100 rounds of this ammo trough a sig sauer p250 no problem. Wish I could shoot some water bottles or phone books would like to see how well they expand. 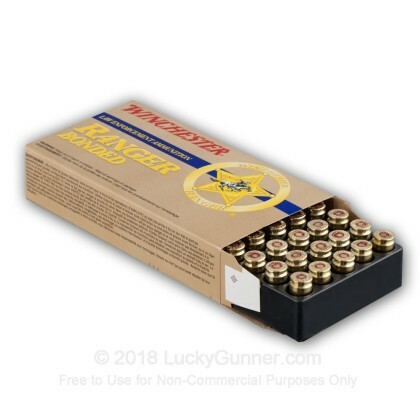 This is the same round as the PDX1 Personal Defense but in a 50 round box. 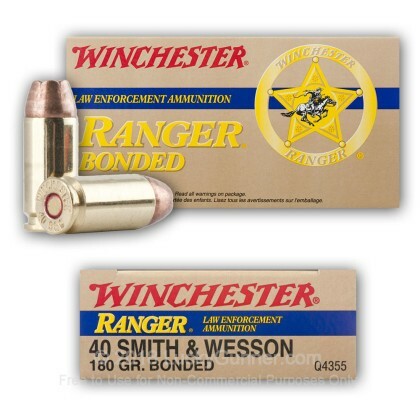 I have both and the only visible difference is the Ranger Bonded has a brass case as opposed to nickel plated brass. Great value. Felt recoil is soft (relatively speaking) and muzzle flash is very low. I was satisfied with the performance of the non-bonded 180 gr JHP but this Bonded bullet does hold together better. This is one of the best Personal Defensive rounds out there. The price is great, just like the round!!! Q: Can you email me when in Stock, how much are they. A: Hi Jeff. Due to the sheer number of people we have looking for every out of stock product, we are not able to notify each waiting customer when their product comes in. The best way to make sure you know when a product is back in stock is to check the website often. The more often you check, the better your chance is to find it quickly. You can also give us a call at 800-317-9506 anytime and we will be glad to check for you!